Alarm at 3:30. Eat by 4, leave by 4:30. Pro men start 6:30, pro women 6:35, the rest of us at 7. I got six great hours of sleep (thanks, Ambien! ), stretched, blinked, and rolled out of bed. I pulled the tags off my new white Wattie Ink. World Championship edition kit, and threw it on, then headed to the kitchen to hit the go button on the coffee maker. I had two packets of Quaker Oats (maple), a banana, and a bottle of infinIT (no protein in this mix). The infinIT was swapped out for coffee as soon as it was ready. Russ and I nodded good morning to each other, but went about our respective business. I went back to my bedroom to savor a little more time horizontal, and check posts, Tweets, and texts. During the dark moments on the course, it always helps to know exactly how many people may be watching. Russ and I did a final check and headed out the door, special needs bags in hand. We trudged down Ali’i Drive, in the dark. I noted the stars and the breeze, and looked toward the ocean as we crossed a bridge. There were some serious waves out there. About ½ mile down the road, someone offered us a ride. Turns out it was Matt Curbeau and his mom, Bonnie. She was able to roll us right up to what would be the finish line chute later that night. We cut through the King K Hotel on our way to the massive tent behind it. We dropped off our special needs bag(s) along the way, and got body marked with those big, greasy stamps. Athletes were strewn all over the lawn in various states: sleepy, fear, denial, acceptance, jovial. We skipped through them and headed to the transition area on the pier. I headed straight to my bike (blue arrow) to set up my nutrition, computer, helmet, sunglasses, etc. I slapped on a Wattie tattoo on my right shoulder and a PowerBar tat on my left arm, and then turned to the porta-potties nearby. Sorry for the level of detail here, but these porta-potties? Their doors face away from transition, so you wait sea-side at the end of the pier (green arrow). As I walked toward them, I heard someone gasp. I came around to the end of the pier and saw two sea turtles floating not two feet away, checking us out. These were the first turtles I had seen all week. I completely squealed with delight. Russ was there, too, so we laughed and hugged and watched them a little longer. One submerged while the other took a last peak and breath, and then submerged too. A woman next to me commented how fantastic it was, and I realized it was someone I met earlier in the week (Helen Kay of NZ). We wished each other luck and to have a fantastic day. I returned to my bike to find Sarah J. Robson Braunshausen nearby. She got first in our age group at IMOO when we qualified. It was great to wish her luck. I then ran into Ryan Frederickson applying sunscreen on one of his buddies. I made him smear some on me, and then slapped a PowerBar tattoo on his lower back. TRAMP STAMPED! Good luck, buddy. “The moon is smiling at you.” My volunteer caught me pausing, taking it all in. 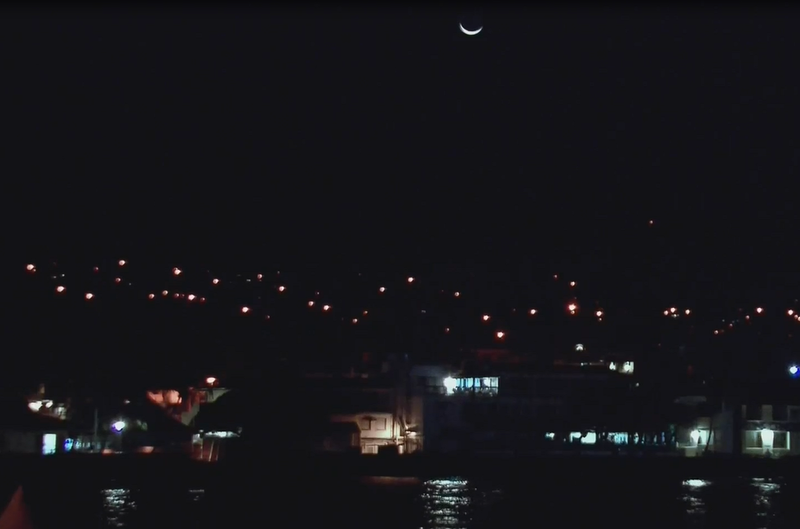 Sure enough, the crescent moon was lit from beneath and looked like a little grin. Smiling moon on race morning. Well, between the moon and the turtles, it was shaping up to be an auspicious morning. There was plenty of time to kill and admin to do back on the lawn. I realized I needed a bike special needs bag for an additional nutrition bottle, so took care of that, dropped off my morning clothes bag, and sat with a gel and a bottle of water near the Vaseline table. I put LOTS of that all over my neck and shoulders to prepare for my first time in a Blue Seventy swimskin (thanks again, Lindsay!). Nothing like new stuff on race day! The swimskin worked great. That woman next to me is totally peeing. Oh, and see my goggles? Those were part of our schwag bag. This set the tone for a pretty light-hearted day. I swam close to the sea wall for a few yards, took in another 360-degree view, then made some last minute adjustments: I realized my pony tail wouldn’t let me get my helmet on later, so took off my cap and goggles, readjusted it, and put my goggles on first so the strap was underneath my cap. I don’t usually swim this way, but I heard the contact here was so bad, I might not want to risk getting them kicked off. I swam parallel to the start line to scope out where to park myself. Steve Johnson said he liked to be pretty far left, but in front, and he found clean water there. That’s about where I landed, too: maybe 30 yards from the end of the line-up, in the 1.5th row (two guys were slightly ahead of me, off both of my shoulders. They said they planned to swim about an hour, so I felt comfortable here). The sun came up over the volcano, and I said “good morning, sunshine” out loud. Some of the dudes near me turned, smiled, and nodded. It’s nice to know in a field of athletes of this caliber, no one takes themselves TOO seriously. The cannon never went off. It malfunctioned, so we just…went. ACK! Alright! Splash splash splash, arms and legs everywhere. 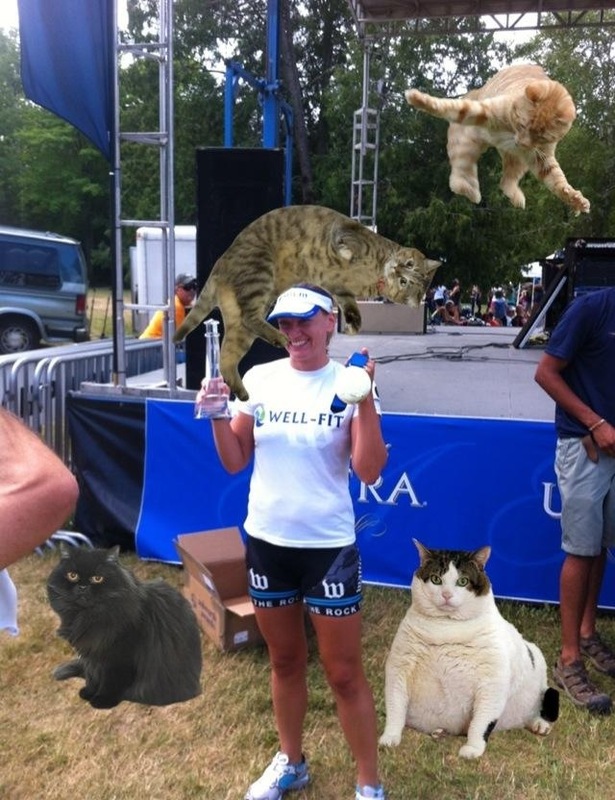 At most races I can break free of the crowd within a few strokes, but I was completely surrounded here. Still, I had ZERO contact. None. I did not get kicked or punched, I did not have to shorten my stroke, and I did not have to sight. It was pretty nice, actually. I remained pleasantly surprised until my group got a little crammed next to a buoy. I caught a fist in my eye socket then, but nothing too bad. The turn was a little screwy—the buoys weren’t quite lined up with the catamarans, so we zigged and zagged a bit before heading back. I should say here that all week they had been adding buoys along the swim course. It seemed like each day another buoy was added to the end of the line, until we could see the last one from my parents’ condo, 1.7 miles down the shore. It is a MUCH longer course than it looks on the teevee. The way back was quicker, but became a little more congested toward the end. By then I had named a few characters near me: Feet, Red Suit, Chick Over Here, Chick Over There, and More Chicks (alternatively, Pink Caps) kept coming nearby. Yes, I could have raced them, but I decided it wasn’t worth it. I just tried to keep my stroke long while my shoulders got fatigued. Soon I was swimming REALLY CLOSE and parallel to the pier alongside a Pink Cap. I stayed on the inside, hoping I could get a quick exit. I also tried to stay conscious of the wave action as we got closer to the exit. I had seen footage of pros standing up too soon and just as an undertow prevents them from lifting their feet off the sand. As usual, I swam until I couldn’t pull anything but sand, then popped up and ran up the stairs. I don’t use a watch when I race. I can see the benefits; I just never have and don’t really miss the extra thing to think about. I also didn’t look at the clock on my way out of the water. I stripped my cap and goggles immediately, waved to a camera, grabbed a hose and squirted myself, and fumbled with my swimskin zipper. An athlete exiting behind me reached forward and grabbed it for me. Mahalo! I overshot my T1 bag (purple arrow) but grabbed it and slammed myself down in the first chair I saw in the change tent. My volunteer dumped my bag and I looked at the contents. A race belt, which we didn’t need to wear on the bike here, and, YES, gum! I grabbed two pieces of gum, chewed and ran (I CAN do both at the same time!). This helps get the taste of salt out of your mouth. My volunteer took care of repacking everything else. I shoved on my helmet and glasses, buckled up, and ran my bike through transition. The volunteers were great and the path was clear. I got to the mount line and the crowd was incredible. I waved with one hand while I put my foot in one of my shoes and pushed off. So there I was on my bike. I consciously decided to treat the first 10 miles or so like a parade. I waved to people on Palani, everyone was so encouraging! I let dudes (and chicks) pass me. I listened for my name, and heard my dad scream it. 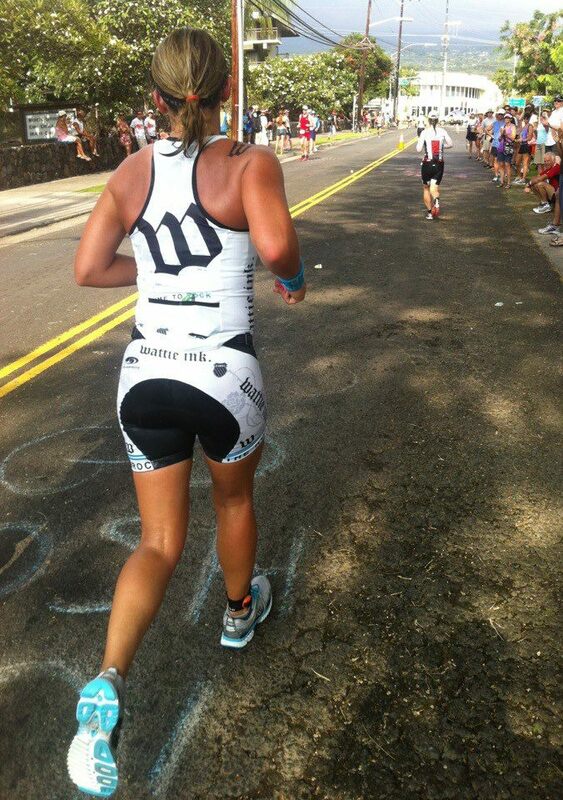 A girl in a Wattie kit came by me and over the course of the next several miles we introduced ourselves. 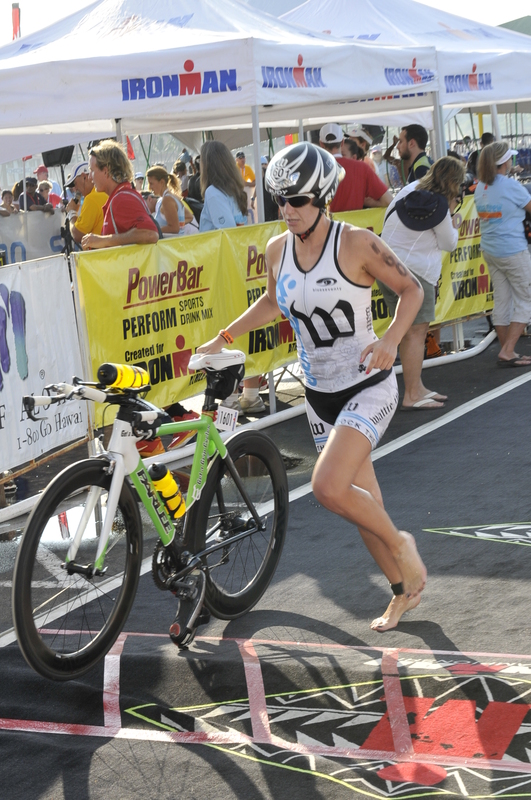 She, Allison Linnell, went on to win the 18-24 year old age group! Around this time I noticed that my bike computer didn’t and wouldn’t turn on. I noted the time on the clock (it read 2:20… the time in New York City?) and kept pushing buttons, but to no avail. I guess I’d be doing this ride by feel: I had no power, pace, odometer, cadence, nothing. The out and back on Kuakini was mayhem: first, Mustafa and Tina made me jump out of my skin, they yelled so loud! Then there were athletes everywhere and it was impossible to ride legally. It was fast, too. I saw Russ not far behind me after the turn around and kept an eye out for others. Soon we were heading back up Palani toward the (in)famous Queen K. I spun uphill, then shifted into my big ring. Somehow I threw my chain off. That was a surprise. I stopped briefly and put it back on. A spectator offered help and wished me better luck and a good day. Mahalo again! I think Russ passed me while I was stopped because I didn’t see him again for 60 miles. We all tore up the Queen K on that smooth black bitumen. It was really pretty, and I didn’t notice the wind. Yet. Except for the other athletes and the occasional aid station (every seven miles after you leave Kona), it was a pretty lonely course. North of the airport, there are maybe four crossroads and one golf course where spectators congregate, then the town of Kawaihae before the road tips up toward Hawi. North of Kawaihae I really took note of the wind. It was bad. I had been expecting the worst, though, so when I felt it, it didn’t shock me. First it was a pretty terrible crosswind that felt like conditions at Kansas 70.3 earlier this year. Except this wind switched directions suddenly. One minute I’d be struggling to stay upright by leaning left, and a second later I’d almost get blown over to the right. I tried to stay locked in aero and push a steady cadence to beat the wind, but occasionally it beat me. Example of getting blown in the wind a bit. The pro men came by at some point, but I couldn’t really identify any of them at high speeds in their new kits and with their small frontal areas. One guy had the lead, one guy had a flat, another guy in green and yellow was passing him by as I came on the scene. I definitely saw Andy Potts. The women came by too. Leanda and Rinny caught my eye, but I wasn’t really looking. The seven mile climb into Hawi was pretty mentally excruciating. I didn’t have any idea what my speed was, and that’s probably a good thing. I’m sure the conditions and slow speeds there bruised a few egos. Sugar cane leaves fluttering on the side of the road reminded me of hurricane footage. I was surprised to see happy people with hair blown in their faces standing around in Hawi. Are they used to this wind up here? I grabbed my special needs bag on a slow roll, a volunteer running alongside me as I dug out my bottle of nutrition and handed the bag back to him. Then the fun started: downhill and with a tail wind, WHEEEEEEE! This time I was sorry to not have a working computer. A few miles later I felt a splatter from a guy I was catching up to. As I passed, I asked if he just peed on me. He swore he didn’t. We mostly-legally passed and re-passed each other over the next several miles, and came to find out he’s my teammate John’s good friend Craig from Milwaukee. Such a small world. The last 30 miles or so into Kona were slightly miserable. I had been taking salt tabs occasionally, whenever I felt particularly bloated (I was super puffy in general, so it was hard to tell), and at one aid station I grabbed a cola just to see how that would treat me. I really REALLY had to pee, but I really didn’t want to stop pedaling. I’m sure I slowed down significantly. The good thing is that I eventually did pull over to the shoulder to slow down and pee just as a mini-peloton that had been cruising around me got carded. They were all drafting, but one woman in particular was also blocking, so she got the penalty. Soon enough familiar landmarks came back into view: the oasis-like beaches north of Kona, the airport, the Energy Lab. As we got closer to town a woman was riding down the middle of the highway shouting “GOOD JOB EVERYONE!” and giving the thumbs-up. I identified her as Chrissie Wellington just before passing by and thanked her for being out there. 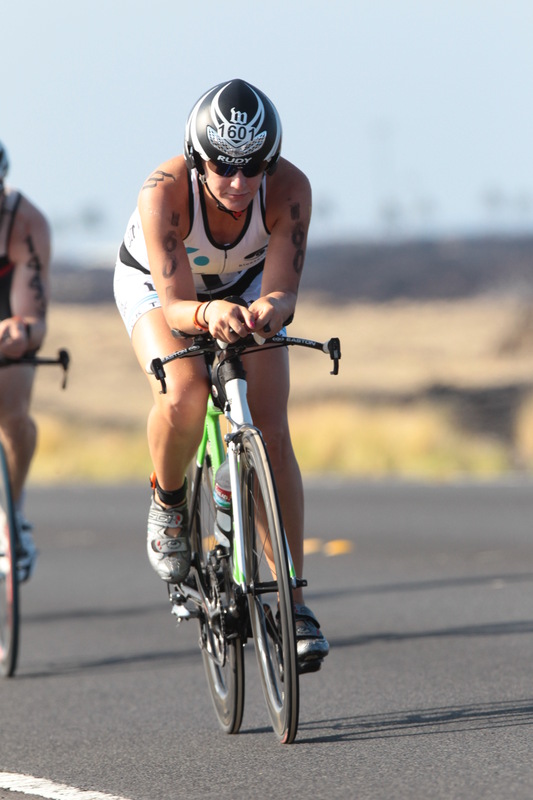 More squirrely bits of the course led back into Kona, and I hit the very-exciting Hot Corner. Again, the crowds were deafening, stadium cheering for everyone. I smiled and waved my way down Palani and was happy to kick off my bike. Except for the whole looming marathon part. My legs felt great. I’m sure not having a computer and generally slowing down in the second half of the bike helped me “conserve energy” (i.e. I likely didn’t go hard enough). 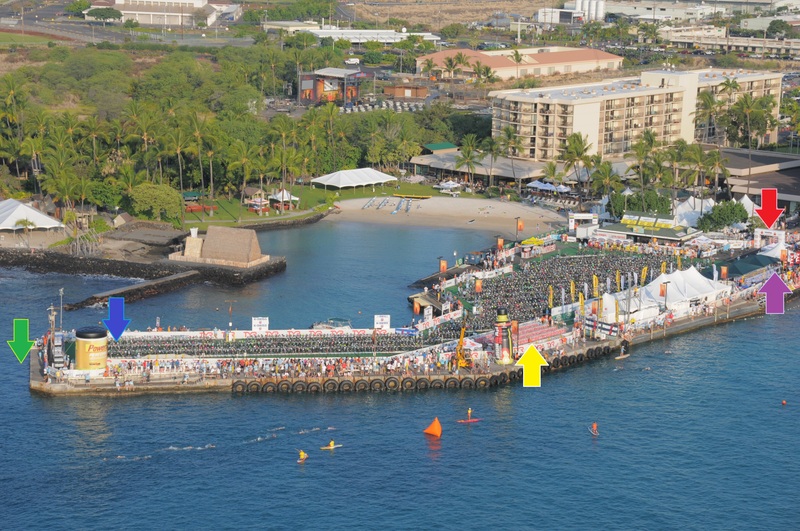 I zoomed over the green carpet to the end of the pier and doubled back to the T2 racks (yellow arrow). I really really overshot my bag and had to run back for it. I tore into the change tent and didn’t want to trip over anyone on my way to a chair, so just dumped the bag on the ground and started sifting. Volunteers came over with everything I needed: a towel, cup of water, and sunscreen. I wiped off my feet and put on my Smartwool socks and KSwiss shoes while someone put on my race belt as someone else carefully applied sunscreen to my shoulders and neck. This transition could have been faster by a) not running past my bag, and b) putting together a smaller go-bag of things I could deal with once running (visor, Garmin, race belt, etc.). HOWEVER, I think a 3:30 transition is pretty worth getting sunscreen on, especially in Kona. Still, I was happy to run out of there not looking like Casper –sometimes they get a little over-generous with the sunscreen. With profuse thanks I popped off the ground and ran out of the tent. I left the pier for the crowds lining Palani again. 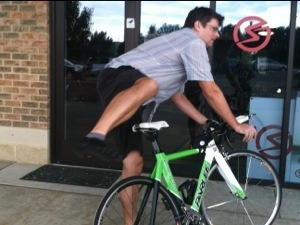 My legs were still spinning in bike mode and I had to consciously slow my roll. I have no idea what pace I was running, but I felt great. Even my back! 1) A latex glove I stole from John’s hospital room a few weeks earlier. Studies have shown that one of the best ways to cool down your core temp is to hold ice in your hand, or better yet, submerge your hand in ice. That’s what the glove does, plus the benefits last longer as the ice melts into cold water, AND you don’t have to TRY to grip anything. The order of the day was to stay cool. So I dumped several cups of ice down my bra and back, and into my glove at EVERY AID STATION. Later, Mustafa would remind me to dump some down my pants, too, which is THE most effective way to cool down your core. 2) My Garmin. I was about to strap it on when realized that, because I hadn’t run all week due to my back, I also hadn’t turned it on and located satellites. Guh. Sure enough, after several minutes, it asked “ARE YOU INDOORS?” Grumble. Whatever. There was a lot of support along the roads and I waved to many familiar faces. Stacey found me on Ali’i, then Paige and Zev were across from Lava Java, standing in the shade of a telephone pole and Paige’s GIANT HAT. Paige’s brim flopped up and down as she jumped and screamed for me. A few blocks down the road Henry started yelling at me. I smiled and just handed him my Garmin. “Make this work, please,” and I carried on south. Ali’i rolls a bit, so I saw my dad on the uphill that led to our condo’s driveway. He shouted encouraging words and waved up the road to my Aunt Linda, who ran with me for several yards too. My mom was in a lawn chair at the driveway. I waved to her, and it always cracks me up how surprised she seems to see me. After the turn in Keauhou, things started getting tough. My quads tightened significantly and it became that much more difficult to run. I remembered that last year at IMOO my quads tightened around mile 18 of the run, and a little while after, Sarah came back to win our age group. This time I saw my teammate Erin Kersten running strong behind me. 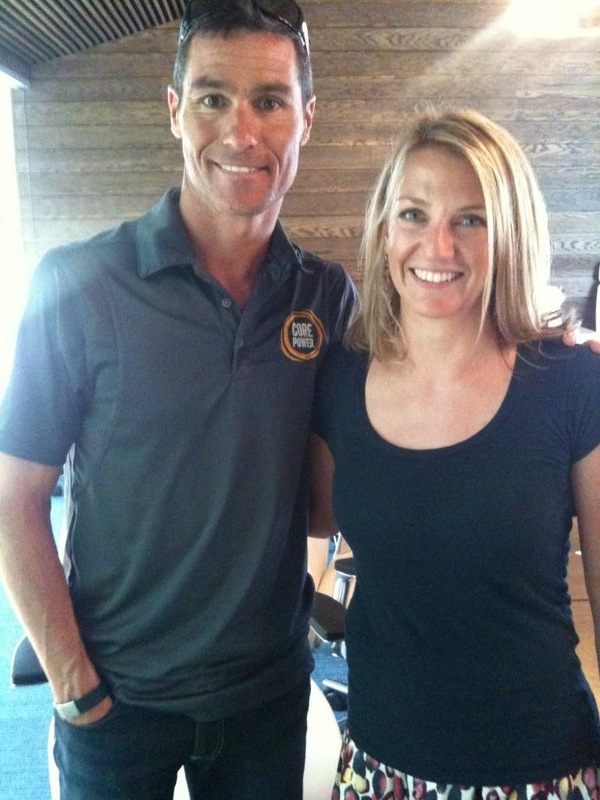 She’s been inspirational to me for several years in both her focus and dedication, and this season she threw down at Ironman Canada to qualify for Kona. I knew she was beyond strong enough to catch me, so I just made a mini-goal to delay that for as long as possible. I had one or two things helping me through the pain, though. First, I was still smiling (most of the time, anyway) and enjoying the experience. A certain amount of misery is part of Ironman’s game, but I personally don’t think they should have any major presence in your average age grouper’s race day. Second, I knew a few friends had pitted Erin and me against each other in a bet (along with pairs of other age groupers they knew racing). The loser has to pick up the first post-season bar tab. I knew at least one friend who bet on me and I tried not to let her down! =P pppbbt on the rest of you, HATERZ! But seriously, motivation comes from strange and/or insignificant places once the hurt starts rolling in. I kinda hated the idea of that bet, but it did help me HTFU just a little. Peter Leavitt and Mustafa met me at the bottom of Hualalai and ran with me for a block. Mustafa reminded me about ice down my drawers, and Dr. Peter asked how my back was. So far so good, but I kinda knew the toughest part was yet to come. I power walked up the hill on Palani but the grade evened out and I got moving again soon enough. Fellow Watties, Peter and Mustafa, chased me up Hulalai and reminded me to take care of myself during the 16 miles out on the Queen K.
The Queen K has few resident cheer squads, including the Erdinger tent, which was pretty entertaining to run by. As it was during the bike leg, though, the highway mostly just hosted aid stations and not much excitement. My strategy of grabbing as much ice as possible continued. I took in water and the occasional gel, but didn’t want to fill my stomach. Later I’d start grabbing cola, but really it was ice, ice, and more ice that kept me going. Although my Garmin was working again, my pace meant nothing to me anymore. When I ran it was registering between an 8:30 and 8:50 pace, but then another aid station would come up, and I’d walk. I made the turn into the Energy Lab and straight into the sun. The pavement in there is really uneven –well, a lot like Chicago’s. What surprised me was how LONG that section of the course was. They make it sound like you go downhill, then turn around and come right back up. No, there’s a slight downhill straight west and into the sun (you see footage of this), then you turn left and run for another mile before the turn around. None of it was that bad, but it was as hot as promised. After the turn around I saw Erin again and told her to stick with it. I didn’t think she saw me, but she told me later she acknowledged me with a weak wave. Once out of the Energy Lab, you’ve got a mere eight miles to go. I kept with the ice and water, occasional cola, and after 3pm chicken broth came out. Hey, why not? I had some of that. Kimber was coming my way, smiling, which I was happy to see. Turns out she was having a rough time, but she wasn’t letting it show. At one aid station, an NBC camera was tracking a guy as he walked through, then picked up his pace to a jog. I passed him, so the camera started tracking me instead. The cameraman soon realized I had about two pounds of ice in my crotch and backed away. I started doing the math and, provided nothing happened between here and there, I might go sub-11! It wasn’t over yet, though. I didn’t stop taking aid until I made the turn down Palani. There I started pulling the ice out of my bra and shorts, threw out my glove, and tried to straighten myself up a little for the finish line. Well, I totally forgot the Hot Corner is a “corner,” like you have to TURN there. You can hear the finish line, and can see the pier, but I had several blocks to go yet, as the course loops around one last time so you can finish on Ali’i. That was a minor bummer, but the crowd support buoyed me. I saw Todd and Mustafa and Criss and Valerie on my to the finish chute –and I felt a little bit like Dorothy. I smiled and started doling out high-5s long before I got to the carpet. It was awesome. At the end of the day, my race time didn’t matter (but I went 10:58:37, and I was happy to learn my marathon was just under 4 hours). I had one of the best days of my life and was thanking strangers on the side of the road for it. I surprised myself by not crying. I suppose that means I did a good job of enjoying the moment. 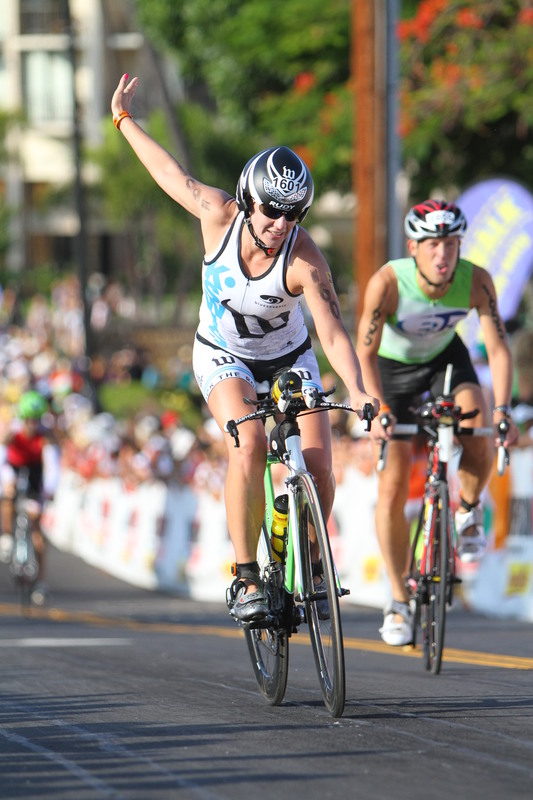 I put my arms up, then turned around at the finish to give a two-armed wave to Kona and the people who helped get me there. This place is powerful and humbling, but I’m proud of a lot: to have had the opportunity to come to this AMAZING island and raced with the best in the world; to have thoroughly enjoyed myself –even during the really tough moments– and not take it for granted that I’m here; to have kept expectations realistic and given myself over to what the day (previous week, season, and year) brought –a true test. I’ve shed more than a few tears in anticipation of this event. It would be selfish and futile in its aftermath to do anything but smile and give thanks for the gift of health, family/friends (ohana! ), and the sun/moon/wind/clouds/(lucky?) sea turtles/competition/helping hands along the way. So, aloha and mahalo, Ironman World Championship! I hope I’m lucky enough to return some day. 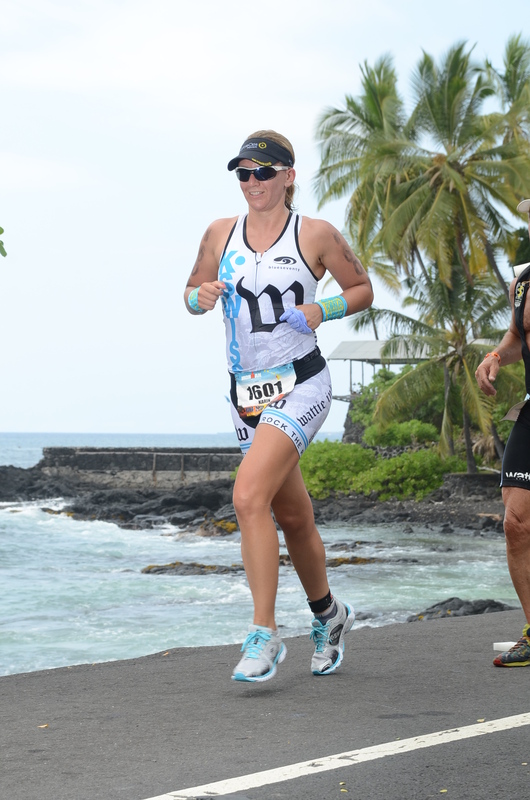 Read more "Race Report (and everything I can remember) from Kona, October 13"
I haven’t blogged about anything that has happened since May. There are multiple reasons for that, namely it hasn’t been an easy summer for me, and I hate talking “aloud” about stuff. Stuff like training, racing, and FEEEEELINGS. The pressure I put on myself in training for Kona and my other races, traveling twice as much as normal for work, major strains in close relationships, and bouncing from couch to couch just didn’t make for happy or healthy times. I’ve known Paige since 7th grade. It’s always like no time has passed. Late May: The week after Galena, I traveled to Austin, TX for work. I had a great time pretending to be a resident, hanging out with my besty from high school, Paige, and her wonderful husband, Zev. Training was limited to Yoga Rave with Tyler at Black Swan, some sickly, sticky hot runs in the evening, and a great 2+ hour ride out of Mellow Johnny’s. I was the only girl there, and pretty quickly realized the only role a chick plays in a group ride is managing the egos of the dudes around her. Push the pace and get caught, drop behind and get asked how you’re feeling. Annoying. I’m on a 50 pound rental bike, guys, it’ll be OK.
Well-Fit Women’s Team at Leon’s hoisting the trophy. 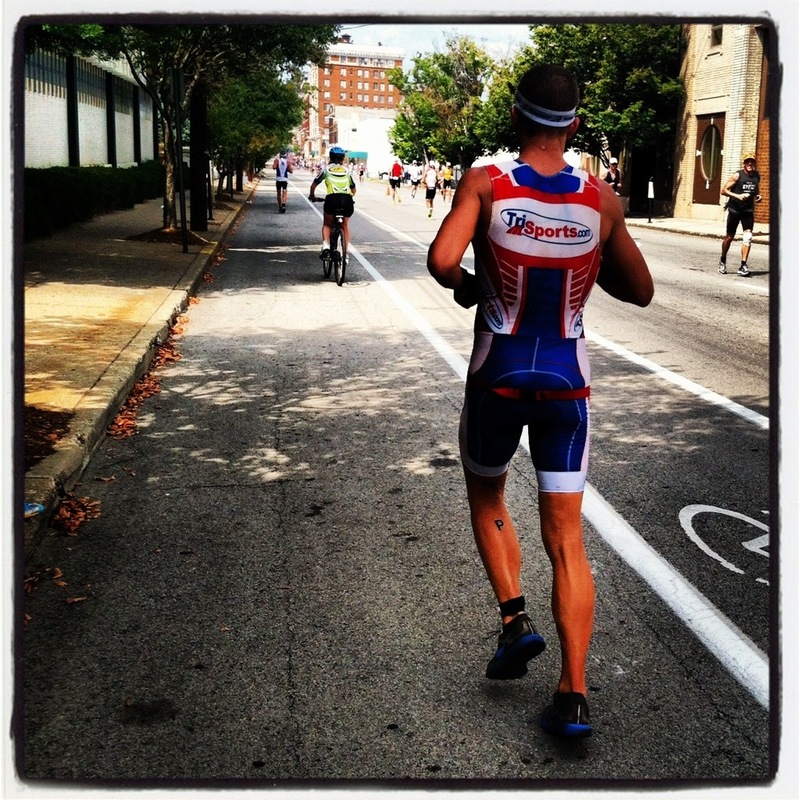 June: The first week of June, Well-Fit represented in a big way at Leon’s World’s Fastest Triathlon. Our women’s team won the team competition (they take the fastest 5 times of a team of 10 people) and a gigantic trophy and some sweet schwag from title sponsor Zoot. I didn’t enter the elite/”all-star” division (it sounded really ostentatious when I registered…), so won the W35-39 division with the third fastest lady-time on the course. 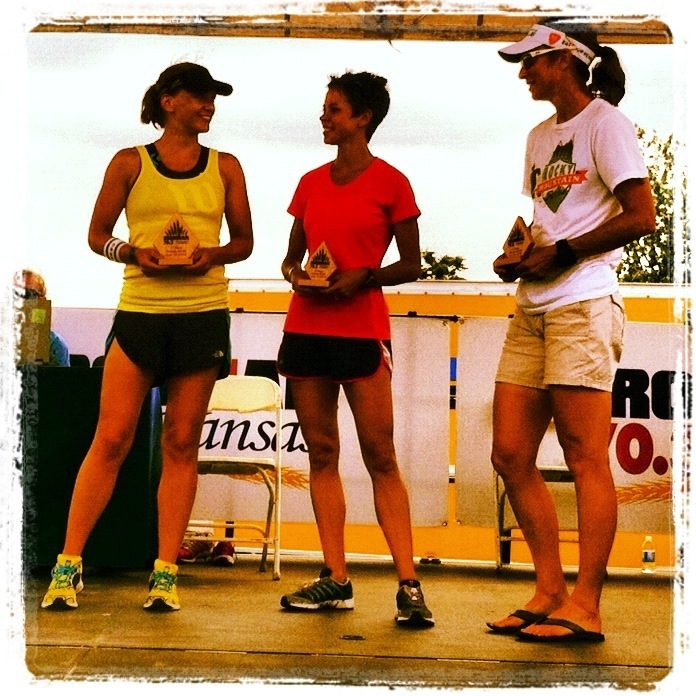 The overall winner was the amazing Adrienne Shields, who also won our race at Galena. 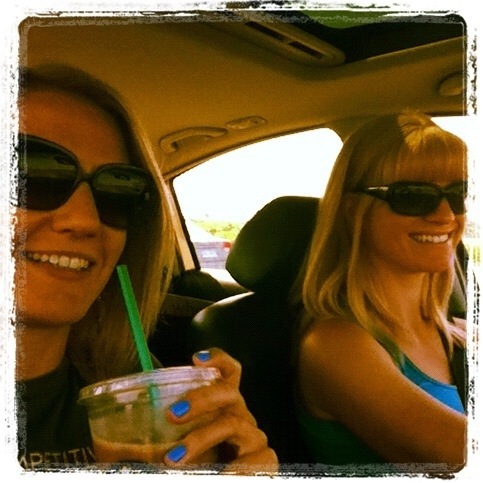 Heading to Kansas 70.3 with Jessica. The very next weekend, a group of us headed to Kansas 70.3. I traveled with my teammate Jessica, and we formed a quick bond over bad coffee, worse pop songs, and stories about boys. We met up with other Chicago teammates and a contingent from Boulder, including former teammate and Timex neo-pro Christine Anderson, her brother Gavin, and thoroughly charming boyfriend, Owen. It was a great trip. I entered the weekend with a bit of anxiety about my preparedness and fitness level, but decided to relax and see what happened. WELL, what happened was a wire-to-wire Age Group win with the 3rd fastest amateur time. Sooooo I earned my pro card (should I choose to accept it, which I don’t think I will). That’s pretty cool. The rest of June was really tough, with tons of travel for work, a fair bit of upheaval in my living situation, and plenty of emotional duress. At least I got to steal away to Madison for a weekend or two to start ramping up my bike miles, but the month was horribly inconsistent otherwise. I also got celebrate with my IMOO teammates at the end of the month (Veronica’s blog) AND travel to San Diego to see some of my family, which was long overdue. David taking care of my bike. July: With only one more ‘B’ race left (actually, two), I entered the phase of my summer where I really needed to buckle down and start adding volume to prep for Kona. 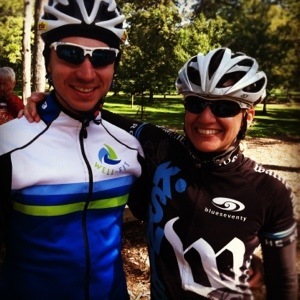 Luckily, I had a number of friends training big too, including Jeffanie: Steph and Jeff, the amazing power couple. They made room for me on their near-weekendly trips up to Madison. My very good friends up there, Claire Pettersen and David Kholi, had room and endless patience for me dropping in on them ALL THE TIME to train. I interviewed Crowie on the 16th thanks to Core Power. Yes, I owe finally wrote a blog post on this subject. It was pretty fantastic, watching him talk about dairy products. Mmmmhmmm. It’s really hard to look pretty next to this guy. The weekend of July 18-19th, my teammate Laura and I traveled to Door County, Wisconsin for one of my favorite races, the Door County Triathlon. It is a fantastic event: organized, fun, spectator-friendly, community-oriented, non-branded, and makes for a really fun weekend. New friend Fons comes up with his family every year, too. Laura and I stayed well outside of town at our teammate Jeremy’s house, with his lovely wife Michelle. 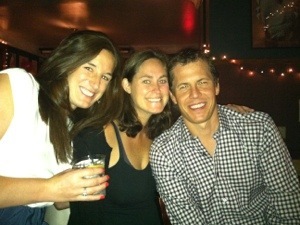 They’re pretty much the coolest people I know, and Laura is a tremendous Sherpa and person. 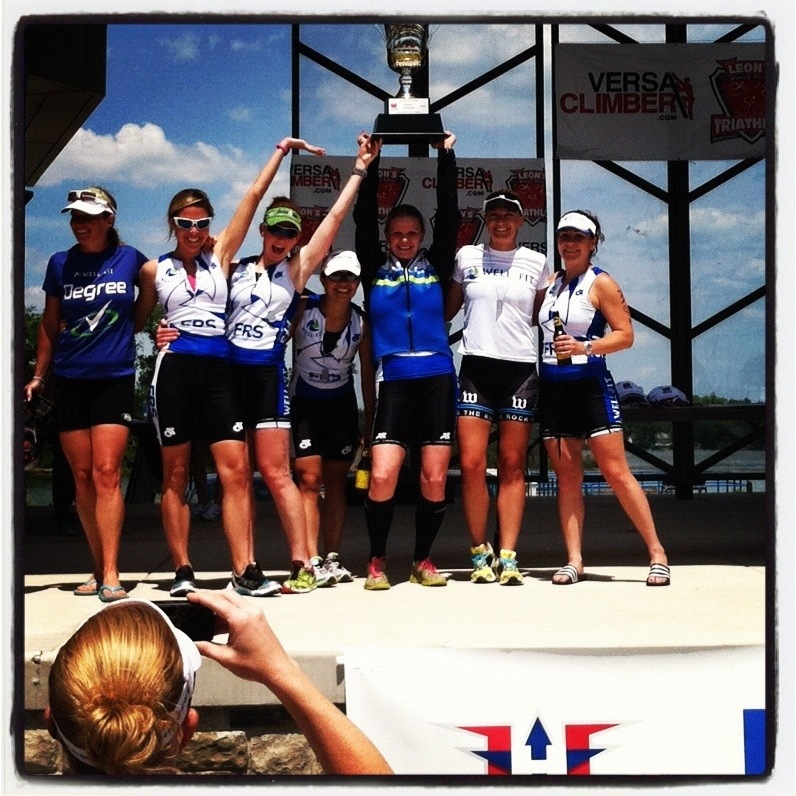 Podium shot with additions from Fons. This was my third year participating in the Half Iron on Sunday, but there’s also a Sprint on Saturday. I wanted to do both races: just for fun, and to jump-start my big-volume training. The Sprint was a BLAST –I hadn’t done that distance in a while and really enjoyed flipping the switch from a mentality of conserving energy for the run to SHUT UP BRAIN, GO GO GO! I won overall by a minute or two. The Half didn’t exactly go my way: there was some stiff competition, including Kimberly Goodell and Adrienne Amman and others. I came out of the water second, then got a flat in my rear tire immediately out of T1. I spent something like 5-6 minutes fixing it. Special thanks to super-studette Jenny Parker Harrison for reminding me to stay calm as she blew by me on the side of the road. The bike was a little lonely and I got pretty discouraged at times. I basically decided to QMB and HTFU if for no other reason than that I REALLY needed to do a long run, so might as well finish the race. So I moved forward in the field during the run (this is new to me), and thought I was in 3rd of the Elite wave. Door County plays it a little differently, though: counting age group participants among the overall results, while not letting Elite participants into the age group results. A dark horse ended up stealing first from Adrienne and a few more pushed me out of the overall standings. Well, I wanted to take home something shiny, but had a great time that weekend. 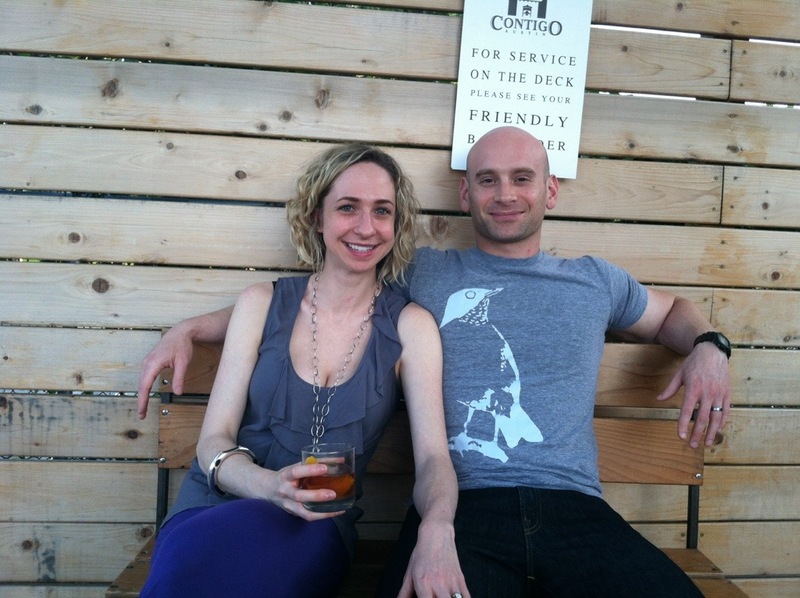 Check out this article on my weekend by Kate Bongiovanni! August: I finally FINALLY FINALLY was able to buckle down a little and get in some good training. I was still traveling for work, but trundled up to Madison most weekends. 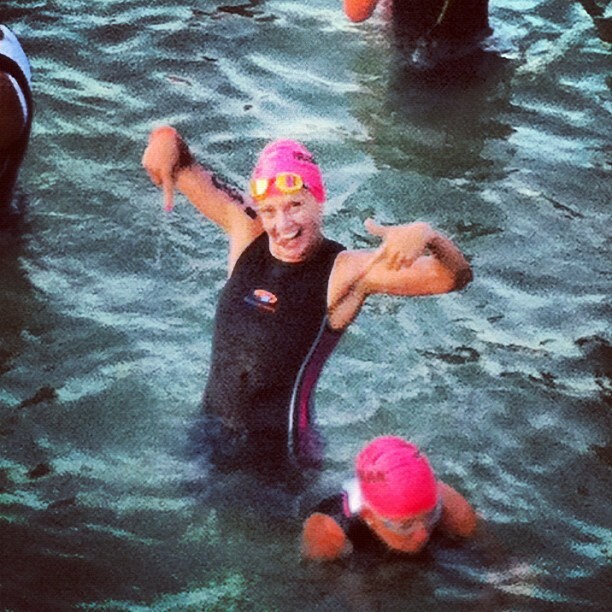 My swim was feeling good, bike was great, but I had no confidence in my run. Track workouts had been going well, but I didn’t do much in the way of long runs all summer. I had a great opportunity to run in Waterfall Glen with the R^3 team and went for it: my longest TWO runs all summer had been at my half irons (13.1 miles) so of course I went for 19 miles with a big “fast finish” push during the last three miles. I did plenty of big bike mileage weekends, too, and had lots of fun with Steph, Jeff, Claire, David, Lindsey Heim, and other good friends. I tried to close my eyes, compartmentalize my life, and just do the work. Work sent me to Louisville the weekend of the Ironman there, so I got to Sherpa and spectate and get inspired by many friends racing that weekend, including pros Jackie Arendt (2nd) and Thomas Gerlach (3rd). I was texting with a fellow spectator at Ironman Canada and learned two additional teammates, Erin and Kimber, would be heading to Kona. Big, big year for us! September: Traditionally the end of the end of the tri season for Chicago triathletes is Ironman Wisconsin. Prettymuch everyone was tapering or recovering at the beginning of the month, just as I was trying to do my biggest volume. Luckily Russ was in the same position so we banded together for a few big workouts, including a 2:40 run and 135 mile ride one weekend. Really, I had done HUGE bikes like that in July, when the IM Lou/Canada crew was building, and again in August with IMOO friends. Finishing up a big ride on a big weekend with Russ. I had a lot of mixed feelings building into Kona: a lot was in my head, not the least of which was major doubts as to whether I had been able to prepare well. My summer was inconsistent at best. Until August, I hadn’t hit a stride in training, and was basically only doing what workouts I could when I could, and making up the rest. I didn’t see a steady progression in my training log and knew I had been battling some major handicaps. Just as I had leading into Kansas, though, I kinda resigned myself to relaxing and taking it for what it is, knowing I wasn’t at my best. They say you can’t ask anything of your first time at Kona: that expectations will be shattered by the conditions and competition. On the advice of many people, including some deep, beer-fueled conversations with Rich Strauss, I decided to basically follow this advice from Endurance Nation and do my best to take control of my own experience there. The race would unfold as it may, but I would not forget that it is an honor just to be there. Thanks for reading. 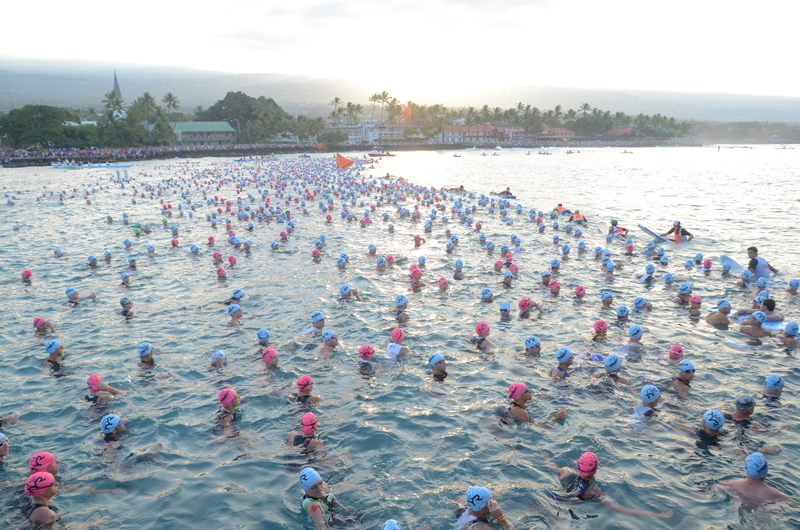 A hopefully more succinct Kona race report is next. Read more "Watt I Did This Summer"